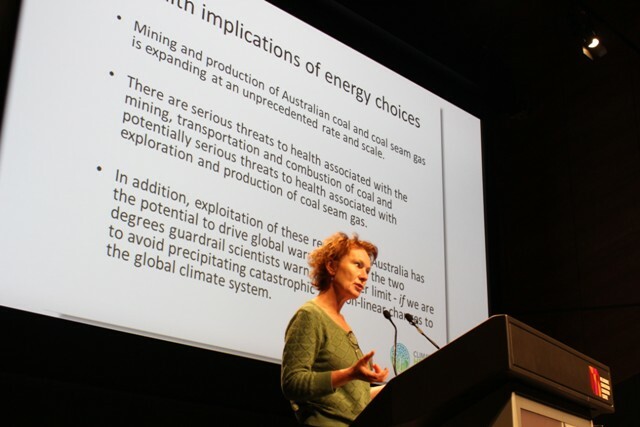 Victorian Nurses and Midwives turn out in droves for Environmental Health Conference There was a large turnout in Melbourne in March when the Victorian branch of Australian Nursing and Midwifery Federation (ANMF “ Vic) held their second interdisciplinary conference about health and environmental sustainability. It was great to see so many nurses in Victoria being involved and showing their support and understanding of the connection between environmental issues and health. The conference was even bigger than last year's successful event “ there were so many registrations the event had to be moved from the branch's education centre to the Melbourne Convention and Exhibition Centre. An inspiring program attracted over 500 members or participants. 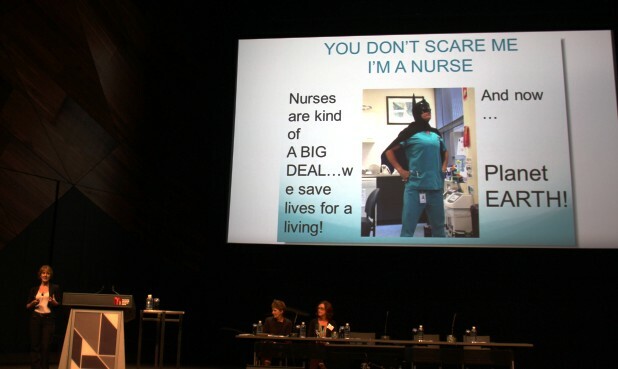 Sustainability efforts were brought alive through positive stories of possibility and practical action, with motivating speakers capturing the attention of nurses and midwives. Congratulations to ANMF for making great progress and expanding their annual Health and Environmental Sustainability Conference, their networks and partnerships. This conference was really an exceptional example of the importance of health professionals getting together and sharing information and having an opportunity to endorse sustainability efforts. Attending a conference of this calibre is clearly appreciated as a useful stepping stone for many health professionals both to start sharing ideas that are already developed without having to ˜reinvent the wheel' and for taking initial steps to evaluate their own workplace practices. Networking opportunities abounded, with the conference providing nurses and midwives with the chance to meet other health professionals within workplaces and across health services sharing the same interest in health and environmental sustainability, as well as the chance to connect with leading experts and researchers who came with their expertise in environmental issues and health impacts. 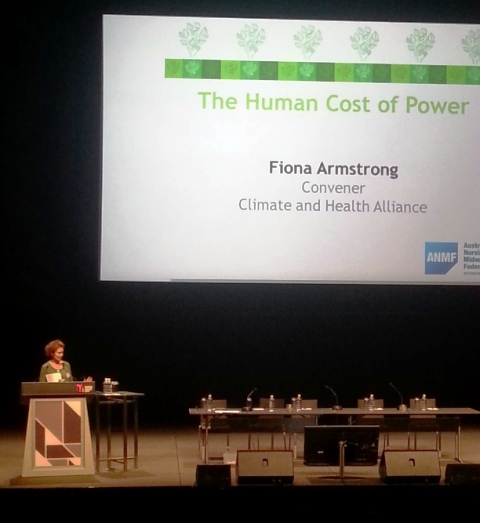 The Climate and Health Alliance was invited to present at this years' conference and screen the CAHA/PHAA film ˜The Human Cost of Power'. Other presentations features practical and achievable ways to improve environmental sustainability and healthy practices at work and make a real contribution and difference to the health of the community and our environment. 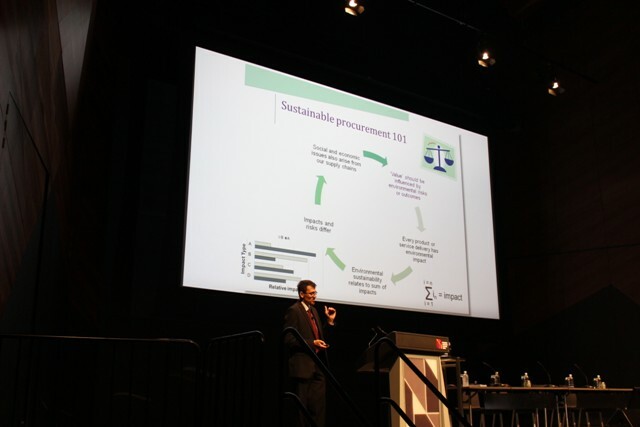 Key speakers included international Dr Barbara Sattler, from the University of San Francisco, Ged Kearney, ACTU President and Jefferson Hopewell, Sustainable Procurement Officer. 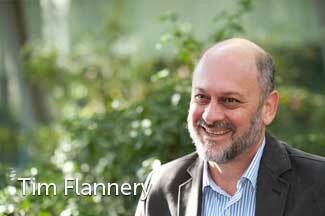 Other speakers included Chief Councillor Tim Flannery from the Climate Council; Kate Auty, Commissioner for Environmental Sustainability Victoria; Bronwyn Aylmer from Barwon Health; Roslyn Morgan from Monash health green team; Aileen Thoms from Koo Wee Rup Regional Health Service, Environmental Sustainability Officer Monika Page from Melbourne Health; as well as Mark Butler, Shadow Minister for Environment, Climate Change and Water. Highlights Dr Barbara Sattler is highly respected nurse academic and public health advocate for environmental health and has been integral in initiating environmental health in nursing practice and education. Some key studies shared by Dr Sattler included a benchmark investigation on pollution in newborns “ and biomonitoring studies of chemical exposure in healthcare found in doctors and nurses (such as BPA, phthalates, PBDE, triclosan). The latter found increased risk of developing illnesses such as cancer and asthma among in many health professionals. Dr Sattler's emphasis was on the need to removechemical exposures in hospitals and other health settings as well as waste reduction. Suggested ways are through environmentally friendly and sustainable procurement, renewable energy systems, improving efficiency in energy and water use, recycling, and composting among many other things. In accordance to the hospital environmental health assessment tool developed by Health Care Without Harm, better coordination around hospital policy, advocacy, education, research and practice settings was underlined. Lastly, Dr. Sattler highlighted the importance of nurses and midwives as trusted conveyors of health information to patients, to community and policymakers. Nurses and midwives can bridge the relationship between the community and clinical information, and thus not only have an important voice but ultimately many decisions about healthy/sustainable choices is in their hands. Jefferson Hopewell from Health Purchasing Victoria told the conference that 56% of environmental footprint in Victoria comes from consumables. Jefferson reports he is (to the best of his knowledge) the only person directly employed in health sector in Australia working on sustainable procurement. Changing to environmentally preferred purchasing practices can be either buyer led or purchaser led and he urged health professionals to make contact with the office of Health Purchasing to discuss greener purchasing options.Barwon Health'sspeaker Bronwyn Aylmer presented a film showing the great work and non-cost driven initiatives being undertaken at Barwon for environmental benefits in the health and food services. They aim to be one of Australia's greenest health service using a closed loop system, composting food waste and generally reduce, reuse, recycle and rethink all resources and products. Environmental Sustainability Commissioner Kate Auty highlighted the science of communication and the importance of using simple infographics when communicating messages, especially important in making broader environmental issues personally relevant. 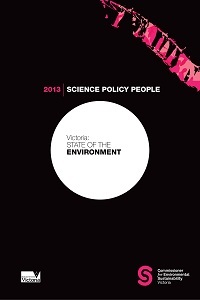 Professor Auty shared the key messages from the recently released State of the Environment Victoria 2013 Report, developed to "inform the Victorian community about the health of the natural environment and influence government to achieve environmental, social, cultural and economic sustainability".Hospitals are massive consumers and producers of waste. Monash health green team are a pioneer in green cleaning replace chemicals with cloths and steam “ it's faster, saves money according to Roslyn Morgan's presentation "From Little Things, Big Things Grow". She concentrated on empowering nurses and bringing the concept closer to home and working environment as well as the possibilities of making a cumulative difference and the opportunities of proactive grassroot and leadership roles as clinical nurses. She Added a forth ˜r' for relationships to reduce, reuse, recycle. 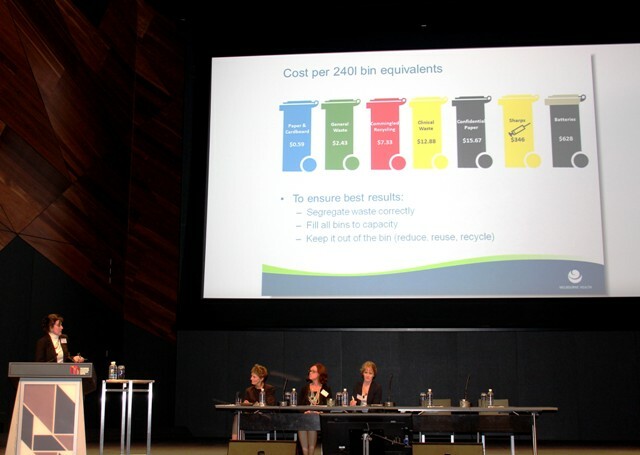 Michael McCambridge and Monika Page Environmental Sustainability Officer from Melbourne Health shared their Think Green Strategy 2011-15 in the presentation "Know before you throw" about the cost of waste. Clinical waste is more costly than other waste and there are many opportunities to reduce disposal of clinical waste. It was especially good to hear the strong emphasis on the public health implications of climate policy from the Shadow Minister Mark Butler, who stated: " Good climate policy is also good public health policy." He indicated he was particularly impressed by the CAHA and The Climate Institute 2012 report Our Uncashed Dividend: The Health Benefits of Climate Action, and overview of the health co-benefits from reducing greenhouse gas emissions. Mr Butler stressed the need to reduce each of these to tackle climate and health relying on especially two pillars: emissions trading schemes and renewable energy policy. Aileen Thoms presented from Koo Wee Rup Regional Health Service - Showing that being a small regional health service is no barrier to making great improvements in environmental health. KRHS are shifting from medical model to socioecological approach to health and reorienting towards being more health promoting and community focused, e.g. 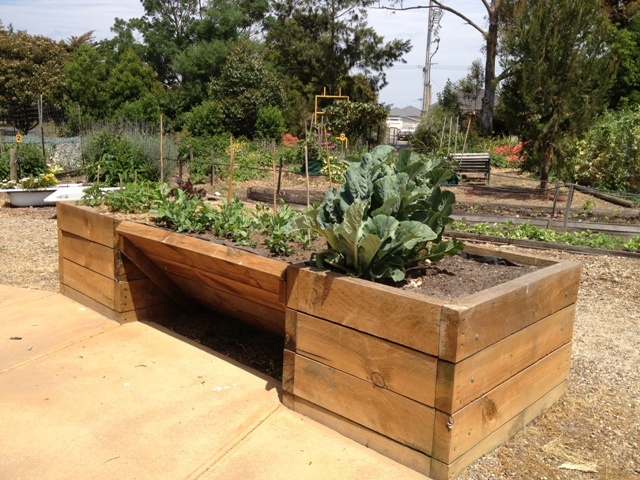 by engaging local community kitchen and garden groups. Koo Wee Rup aim to enhance health and wellbeing by intersectoral partnerships and enabling educative and supportive environments for humans and the planet.